COLUMBUS, Ohio – If you are not enjoying your favorite things as much as you used to, new research suggests a way to break through the boredom: Try the same old things in new ways. Researchers found that people found new enjoyment in popcorn, videos – even water – when they consumed them in unconventional ways. Findings suggested that using unconventional consumption methods helped people focus on what they enjoyed about the product in the first place, said Robert Smith, co-author of the study and assistant professor of marketing at The Ohio State University's Fisher College of Business. "When you eat popcorn with chopsticks, you pay more attention and you are more immersed in the experience," Smith said. "It's like eating popcorn for the first time." This phenomenon may explain such things as the popularity of "pitch black" restaurants that serve diners in the dark. "It may not be anything special about darkness that makes us enjoy food more. It may be the mere fact that dining in the dark is unusual," Smith said. Smith conducted the study with Ed O'Brien of the University of Chicago's Booth School of Business. The results appear online in Personality and Social Psychology Bulletin. The researchers conducted four experiments. In one study, 68 people came to a laboratory supposedly for an experiment about "helping people eat more slowly." Half the people ate 10 kernels of popcorn using their hands, one at a time. The other half ate the kernels one at a time with chopsticks. Afterward, participants rated the experience on a variety of measures, including how much they enjoyed the popcorn, how flavorful it was and how much fun it was to eat it. Results showed that people who ate the popcorn using chopsticks reported enjoying it more than those who used their hands, Smith said. Another finding suggested why that might be. Those who used chopsticks – compared to those who ate with their hands – reported that they felt more immersed in the experience, that it helped intensify the taste and helped them focus on the food. But the researchers then had the participants repeat the experiment. In this second trial, everyone enjoyed the popcorn equally and felt equally immersed, regardless of how they ate it. 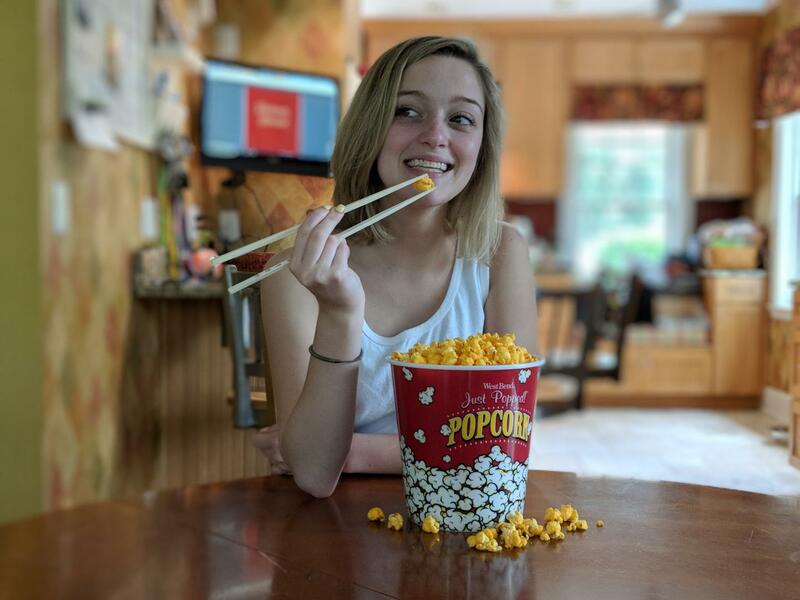 "This suggests chopsticks boost enjoyment because they provide an unusual first-time experience, not because they are a better way to eat popcorn," Smith said. A second study of 300 participants recruited online found that even drinking water was rated as more enjoyable when it was done in novel ways. In this study, participants came up with their own "fresh, new and fun" ways to drink water – everything from drinking out of a martini glass to drinking out of a shipping envelope to lapping at the water with their tongue like a cat. Those who drank water in these novel ways enjoyed it more than those who drank it normally. In the final two studies – one conducted in a lab and one done online – participants watched a one-minute video three times in a row. The video showed an exciting motorcycle ride filmed with a GoPro camera from the driver's perspective. All participants watched it twice normally, rating how much they enjoyed it after each viewing. But the third viewing was different for some participants. One-third were asked to watch the videos using "hand-goggles" – forming circles with their thumbs and index fingers around their eyes, and using them to track the ride by bobbing their head back and forth to follow the cyclist. For another third of the participants, the video was flipped upside down. The final third watched the video in the conventional way. As expected, those who watched the video in the conventional way showed less enjoyment by the third viewing. Those who watched the video upside down didn't enjoy it very much because, even though the viewing was unconventional, it was also disruptive. However, those who watched the video for the third time with hand-goggles enjoyed it more than the other groups. But did participants really enjoy the video more – or did they just like the strange experience of using hand-goggles? Results suggest the unconventional way of watching really did make the video itself more enjoyable. After the study, the researchers offered to let all participants download the video to keep – and three times more people who watched with hand-goggles asked to download the video than those in the other conditions. "They actually thought the video was better because the hand-goggles got them to pay more attention to what they were watching than they would have otherwise," he said. "They were more immersed in the video." Smith said these findings apply in a variety of ways to everyday life. For example, when you're eating pizza, after eating one slice normally, you could try eating one slice with a knife and fork and then folding the next slice. And if you're sick of your sofa, try putting it in another room rather than getting rid of it. "It may be easier to make it feel new than you might think. It is also a lot less wasteful to find new ways to enjoy the things we have rather than buying new things," he said.